Sometimes the best way to see a city or new locale is to go for an early morning run. With only a few cars going by and almost no other pedestrians to get in your way, you can run through empty streets and paths absorbing your surroundings without distractions. 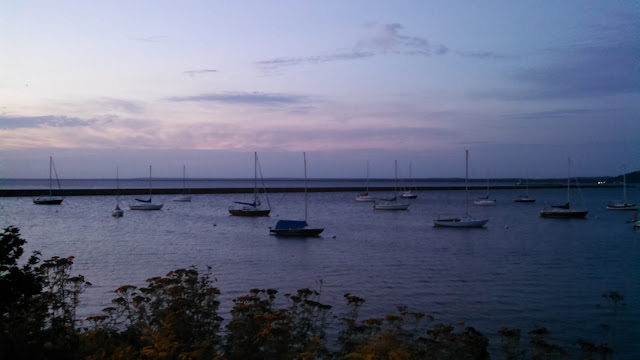 Marquette, the largest city in Michigan's Upper Peninsula, is a great town to go for a run. 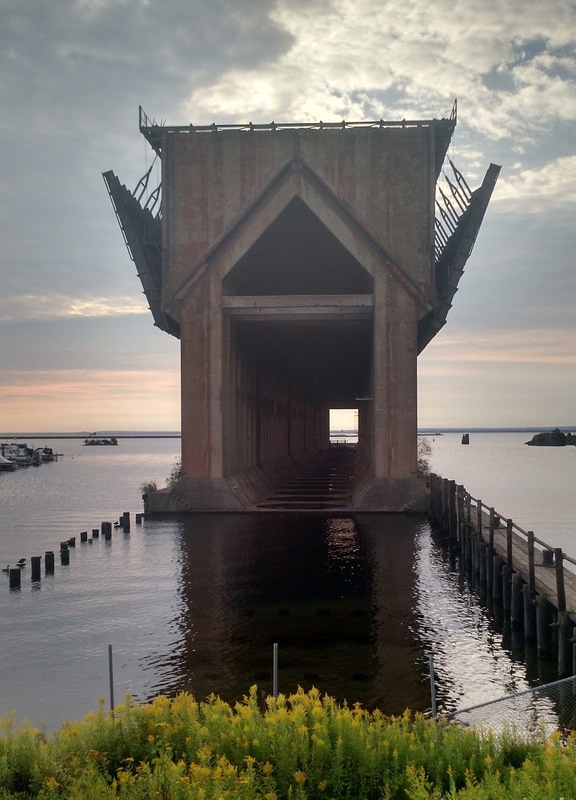 It has multiple running paths in and near the city, including the Multi Use Path that follows Lake Superior's shoreline from Presque Isle through the city until it connects with the Iron Ore Heritage Trail. 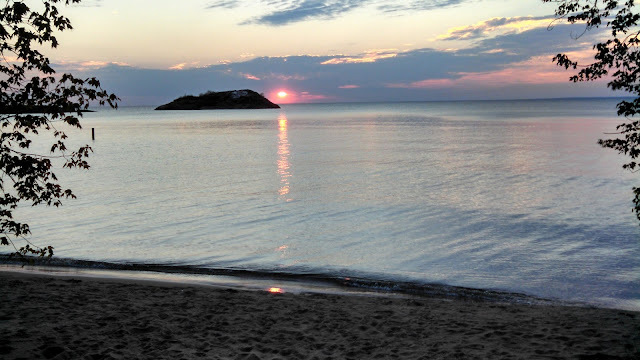 I took two morning runs while on a recent trip to Marquette. 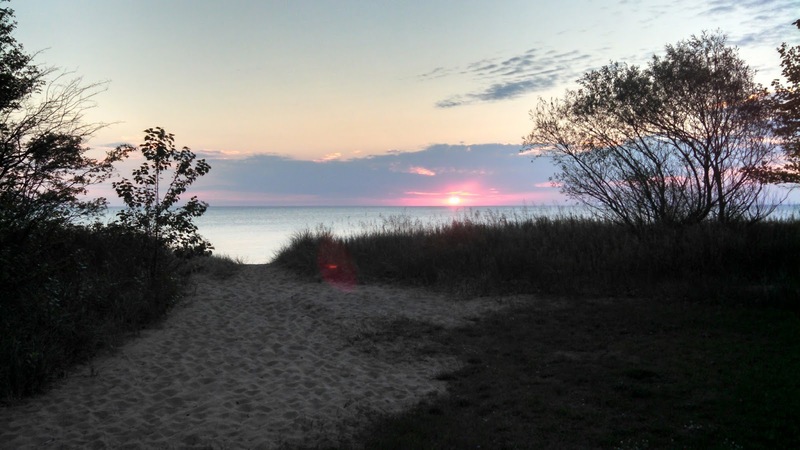 The first morning, I left our rented house near Northern Michigan University and ran north on Presque Isle Avenue toward Presque Isle Park. It started pouring about two minutes into my run, but I continued on and the rain slowed to a drizzle for most of my eight-mile run. 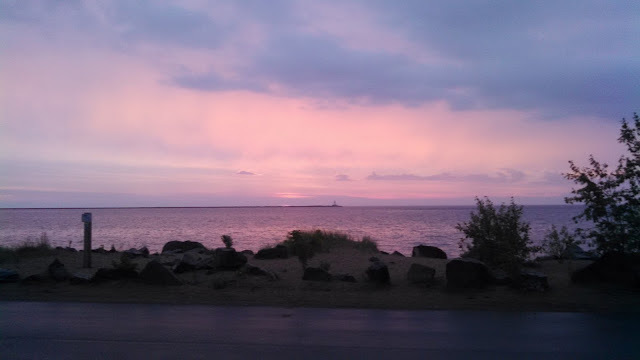 A right turn onto Hawley Street brought me to a beautiful view of Presque Isle's breakwater and lighthouse. 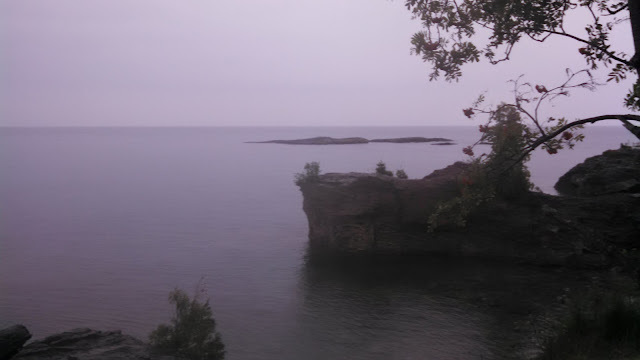 I turned north on Hawley and ran around the perimeter of Presque Isle Park. The 323-acre peninsula ("presque isle" is French for almost an island) has forested foot trails throughout its interior, but I stuck to the even pavement of the outer road. The visibility was low due to the rain, and I did not want to stumble on the muddy trails. I ran with light feet along the wet road, trying to remain silent with the hope of seeing the albino deer that reportedly live on the island, but I saw only a few white-tailed deer as I entered the park. The advantage of hugging the peninsula's perimeter was the views of Lake Superior and Presque Isle's rocky shores, especially after I veered off the road onto a footpath along the shore. I was a little nervous of losing my footing in a couple spots where the trail passed a few feet away from a fall onto the rocks below, but the perceived danger was worth the view. 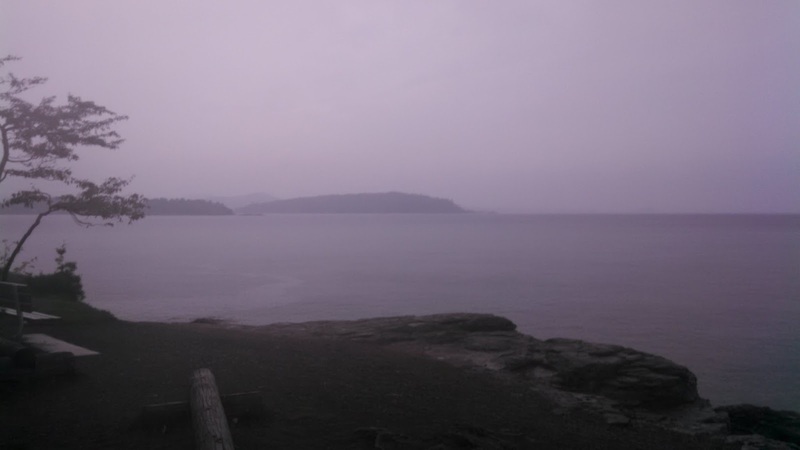 The light rain robbed me of a colorful sunrise, but it made the island feel still and peaceful. The only sounds I heard were my breathing, my feet striking the ground, and water dripping from the leaves above me. 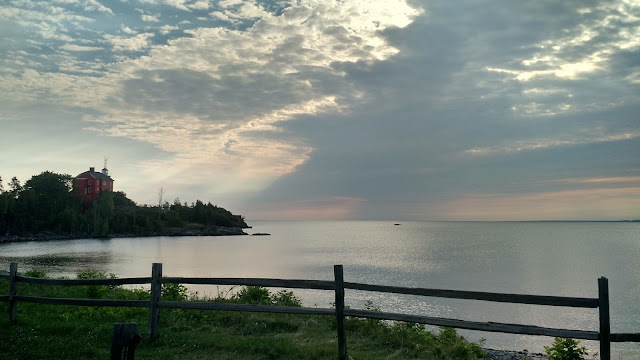 After circling Presque Isle, I returned home by the Multi Use Path along Lake Superior until turning inland toward our house. The second morning, I headed straight toward Lake Superior and ran south along the Multi Use Path toward downtown Marquette. This section of the path winds south through public parks and along Marquette's harbor. The views of Marquette Harbor Light, the ore dock, and the harbor are stunning. It was not raining, so a beautiful sunrise accompanied me on my run. 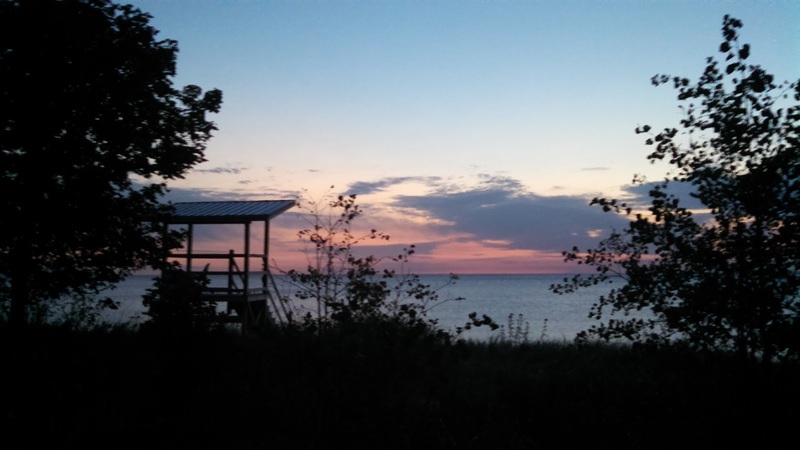 A hint of orange first overtook the dark horizon before pinks and reds chimed in. Even though the weather was nice, I only saw a few other runners and walkers on the path. I ran about 5 miles total out and back. As I approached Shiras Park on the way back to our house, I noticed a few people staring toward the water, so I decided to interrupt my run to see what the fuss was about. I do not normally like to stop in the middle of a run, but I was happy that I ignored my urge to keep running. 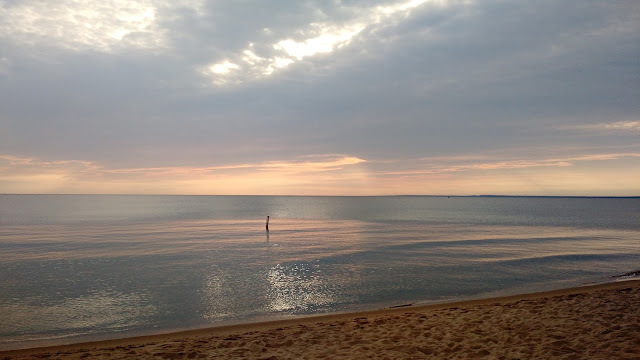 The sun was beginning to peek out from beyond the horizon, and I stood in awe of the colors blanketing the calm waters of Lake Superior. I spent several minutes watching the sun rise from the water. Eventually, the sun rose into the clouds, and I took a deep breath and continued on my way. My wife went for a run shortly after I did, and the sky was still beautiful.